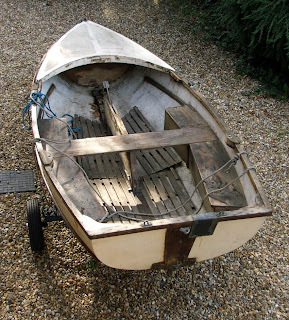 I couldn't resist buying this old Scow, it's been badly neglected and I paid a bit too much for it, but it was still cheap and will make a great boat for Joe. 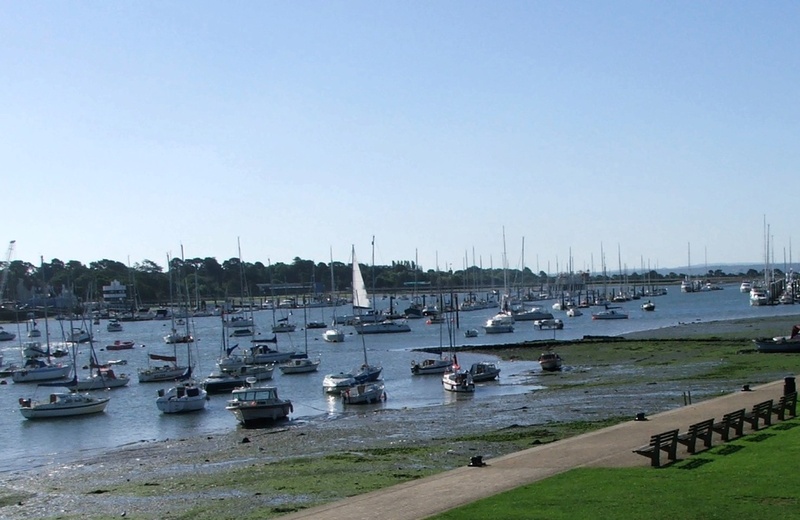 The Scow is a local boat with fleets at boths end of the Solent sailing from Chichester, Bembride, Yarmouth, Lymington and Keyhaven. Originally timber built the design goes back to the 1920's when a one design was established. This latest acquisition to our "fleet" was built by Field Aircraft Services of Tollerton, Nottingham during the mid 1950's. 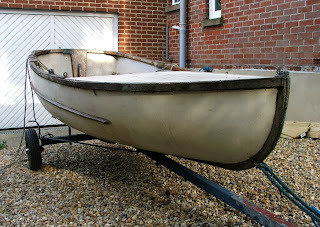 Apparently it was their first attempt at boat building, in order to diversify the business which had experience of making fibreglass aircraft components. It was the third off the line, it is believed all 3 went to managers in the company. Unusually it was marketed as a Scow with a Heron set of sails, rather than the normal lugsail. Clearly there's a quite a bit of work to be done before I get around to replacing the rig. 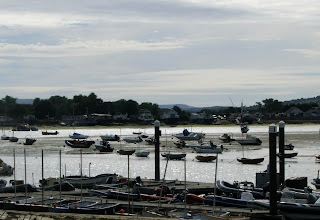 We went to Lymington on Saturday, where there's a market in the high street of the old Georgian town. The market is a good place to get local farm produce from the New Forest, but this onion seller and his produce had travelled a bit further. 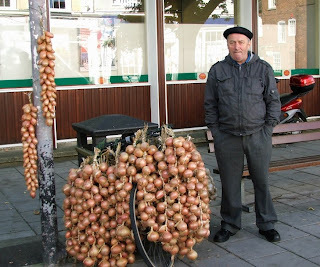 There is a tradition of French onion sellers coming across to England from Roscoff in Brittany. In the post war years and into the 1950's many would bring a bicycle as cheap transport and an efficient way to carry their wares. This chap comes to Lymington in autumn most years and continues the traditional characterisation with his beret and bicycle, although I did notice a French registered van parked just around the corner. In Cowes roads only one boat was left on the moorings, but what a boat! 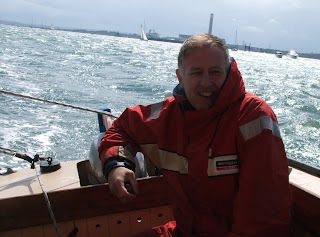 Colleague and fellow blogger Barry has written a post "Sundowners for Andy" about a memorial gathering on Saturday for our friend Andy, who sadly died of cancer almost two years ago. Andy was a party animal and raconteur and always generous of spirit, seen above at the start of the Three Creeks Race a few years ago. In his more philosophical moments Andy would say that most things you do in life last for ten summers before you move on to something new. Before he took up sailing he had been an alpine mountaineer having climbed extensively including the famous Mont Blanc and the Himalayas. "Ten Summers" is an idea that has stuck with me. 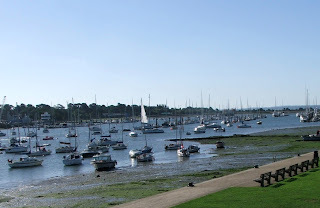 The trouble with sailing to the Isle of Wight is that inevitably we always go to the same familiar places, Cowes, Yarmouth, Newtown etc, so this summer we decided to take the car across on the Red Funnel ferry and have a better look around. 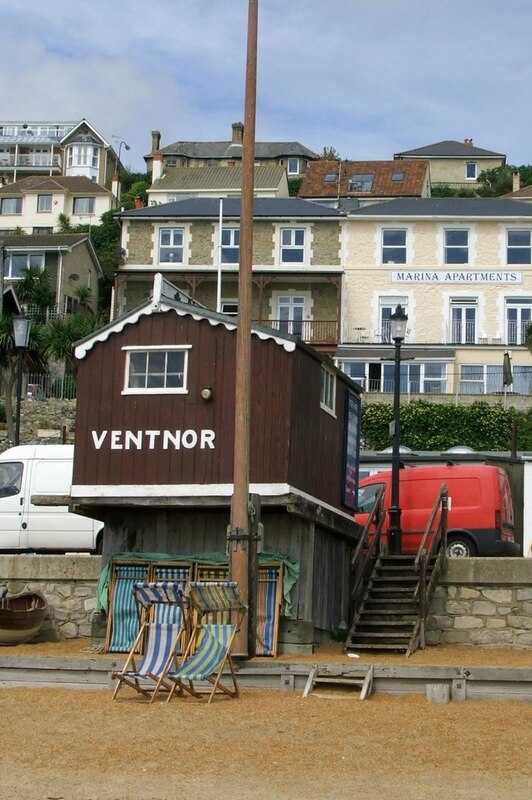 One of the most interesting places was Ventnor on the south east coast, a very steep sided Victorian resort. Despite the small haven, Ventnor located on the south east of the island isn't really a place you would normally visit by yacht. 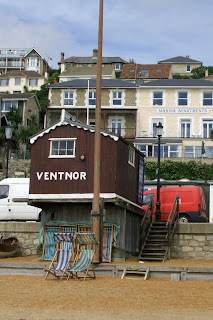 Down on the beach in Ventnor, “Blakes” are still renting out deck chairs from their traditional wooden hut built on the promenade. 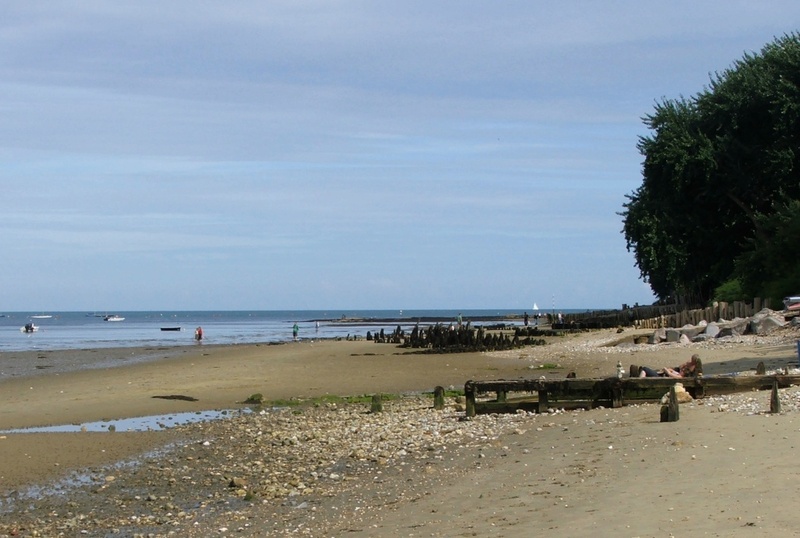 Joe had decided that playing on the beach was much more fun than driving, not difficult to see why, this gently sloping sand near Bembridge is exposed at low water and made the perfect afternoon play spot. 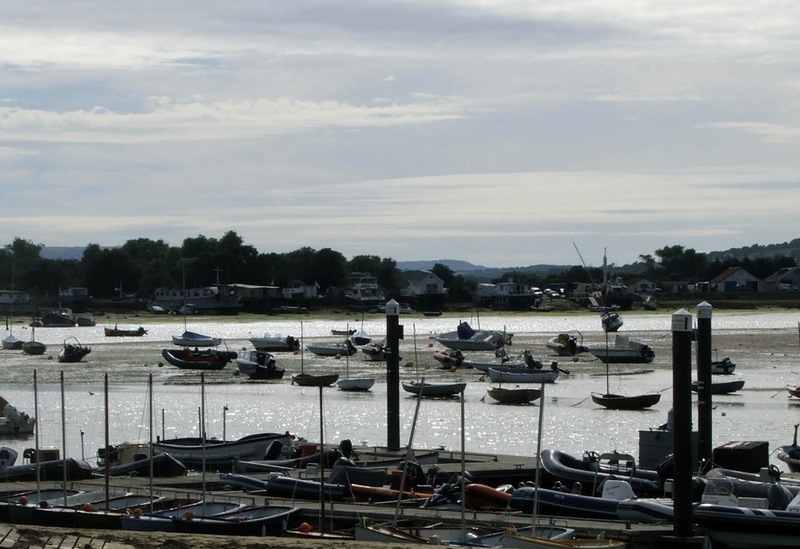 Bembridgeharbour is also a great spot for Dad to get his boat fix, lots of traditional boats, and the eclectic collection of house boats along the harbour edge. Since it dries, visiting Bembridge by car means no worries about tidal heights or waiting on the tide. 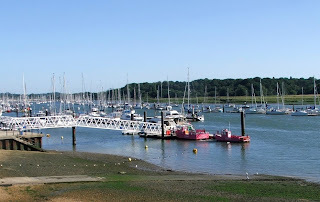 On one of the (few) bright sunny mornings recently we went down , early to Hamble Quay for breakfast. From the vantage point on the upper deck there were great views of the river. 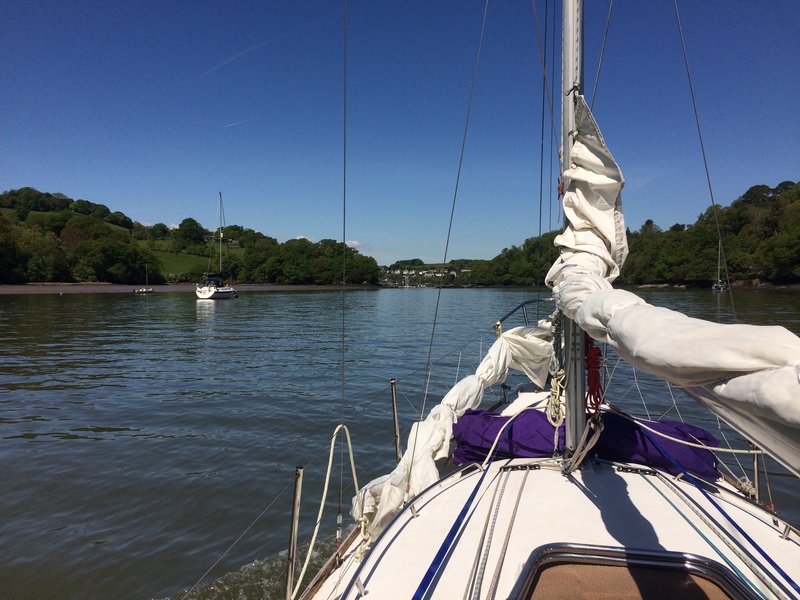 It was a slow day, very peaceful, not even the usual fleet of racers making their way downriver and out to the start in Southampton water. 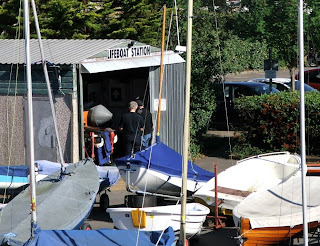 The only activity in the dinghy park was the lifeboat crew opening up the station. Hamble is fortunate in having it's own independent lifeboat service set up over 40 years ago. Below the lifeboat crew sculls out to one of two ribs the voluntary service operates. This year marks the 70th anniversary of the Battle of Britain, when the UK, stood virtually alone in Europe. 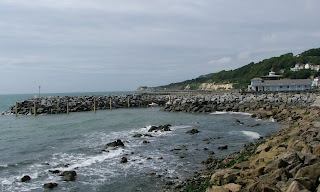 The imminent threat of invasion was averted by the action of the Royal Air Force and largely fighter command, defending the skies along England's southern coast and preventing a sea borne invasion. The campaign ran throughout the summer of 1940 and led to Winston Churchill's famous speech "Never in the field of human conflict was so much owed by so many to so few". After 70 years there is a risk the memory of the event and of those who defended this island nation will fade. 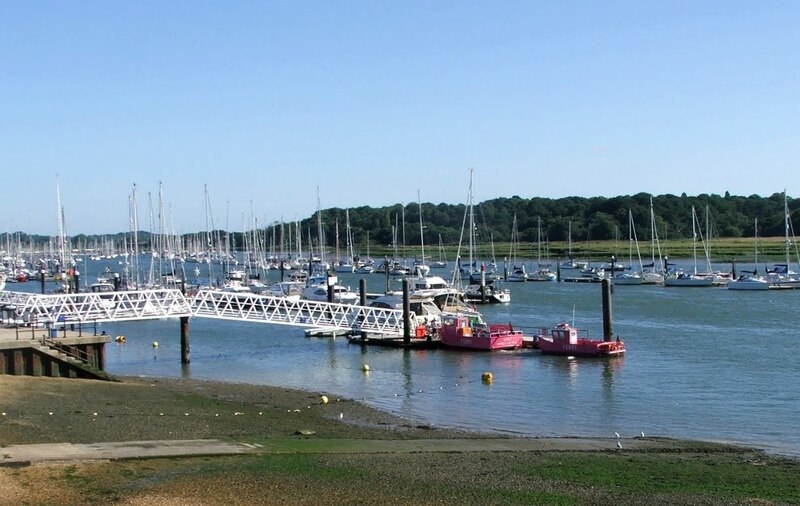 Down in Hamble village however that is unlikely at the RAF Yacht Club. Founded in 1932 by officers of the RAF, the club has a proud if unusual history. RAF service hasn't been a condition of membership for many years and today the club is a modern and active yacht club, but the club's association with the RAF and those who served in combat is still strong. 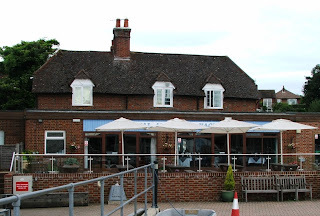 The club celebrates the memory of the Battle of Britain each year with a remembrance service, a club dinner and in recent years the "Battle of Britain Regatta". 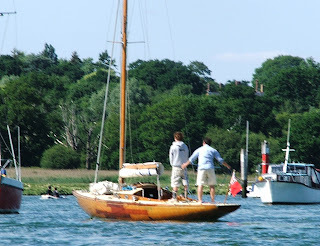 I spotted this lovely varnished racer on the Hamble shortly before Cowes week, sadly at the time I didn’t have my camera, Fortunately she was out on the river again a couple of weeks later while I was rowing, not great photos as I had to grab the camera at short notice. 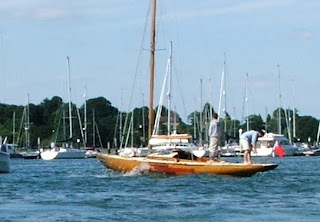 I believe she's called Vixen and is a B15 square meter built near Stockholm, designed by Knud Reimers just before WWII. Brought to the Clyde in Scotland, very different from the sheltered waters of the Swedish archipelago for which she was designed. 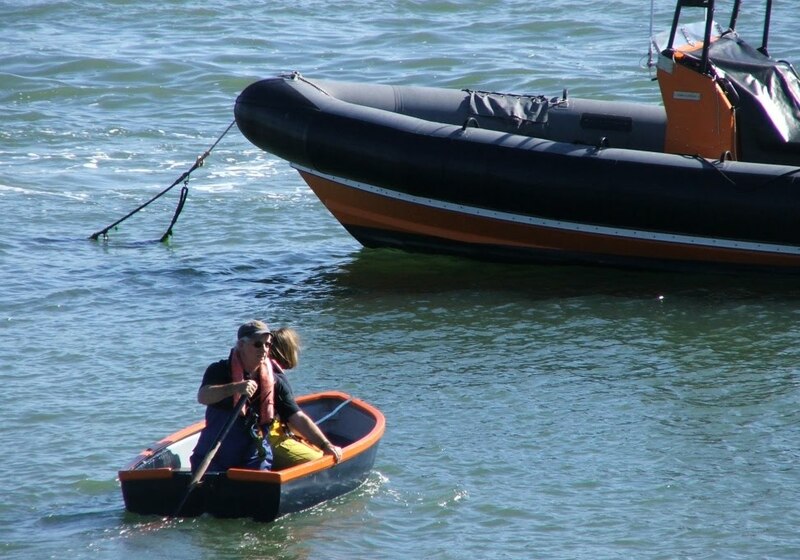 Vixen was declared a total loss in 1988 when she broke free from her moorings and came to rest on the Crocodile Rock off Millport on the Clyde. 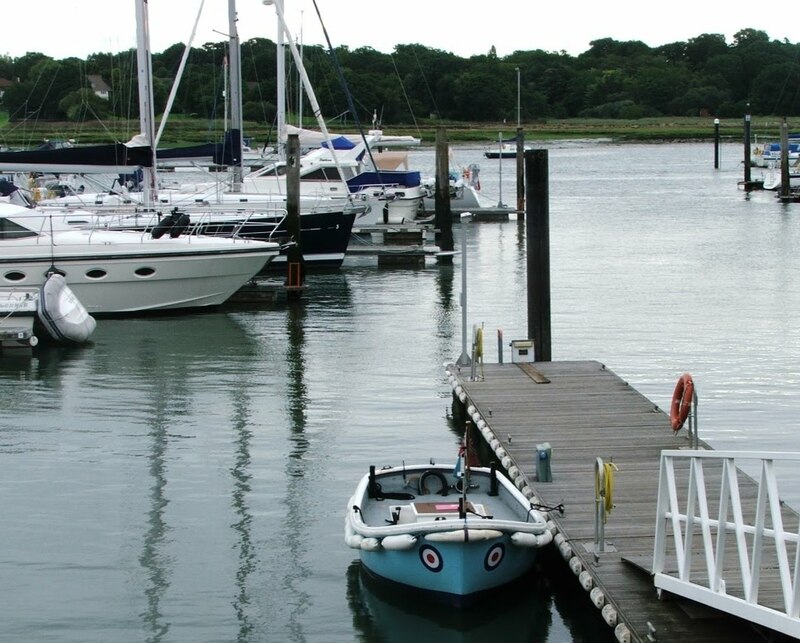 Thankfully her owner recovered her and stored her ashore for thirteen years until a new owner was found to carry out the restoration. 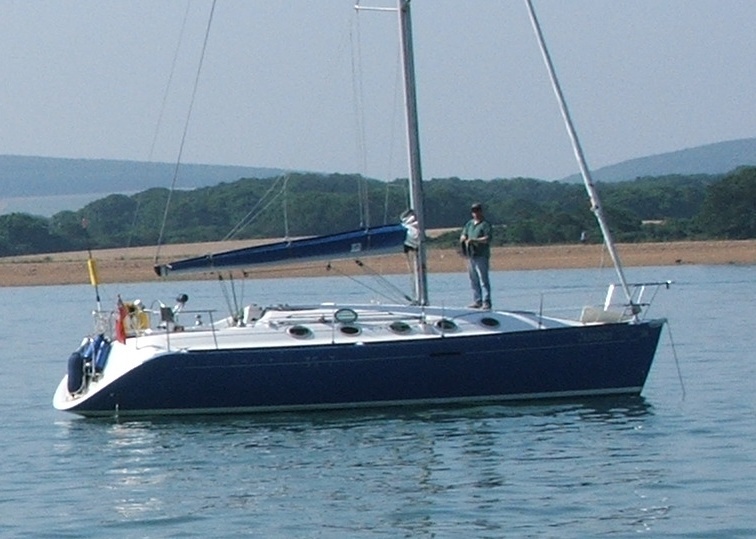 At 33 feet LoA (21’8” LWL), a beam of 5’9” and displacing 1.3 tones Vixen is narrow and light. 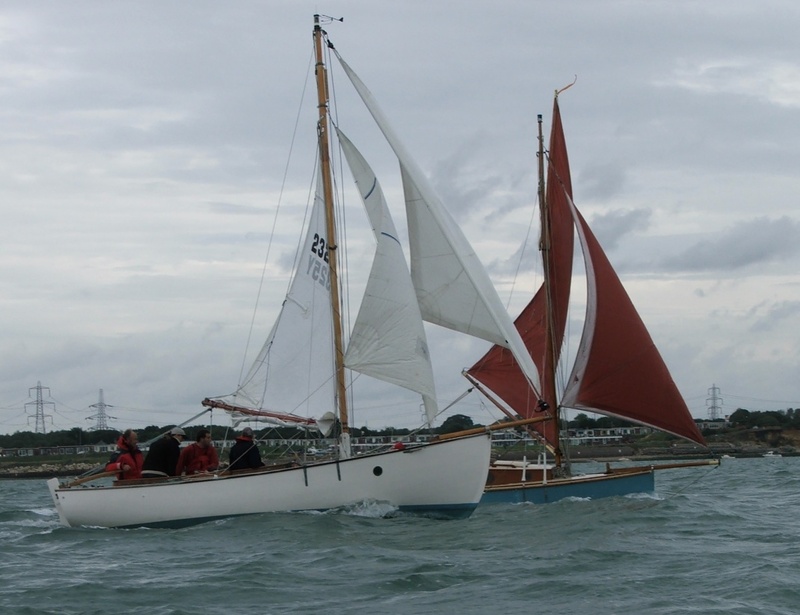 The legendary Uffa Fox, who thought the Skerry type good for offshore crusing, commented on her design in his book Racing, Cruising and Design, saying that the design was “thoroughbred… with easy lines that tell us she would be exceedingly fast in all weathers”. 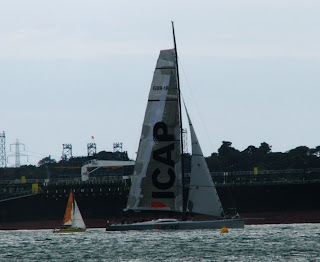 Super MAXI yacht iCAP Leopard overhauls a more modest cruising yacht going up Southampton Water. 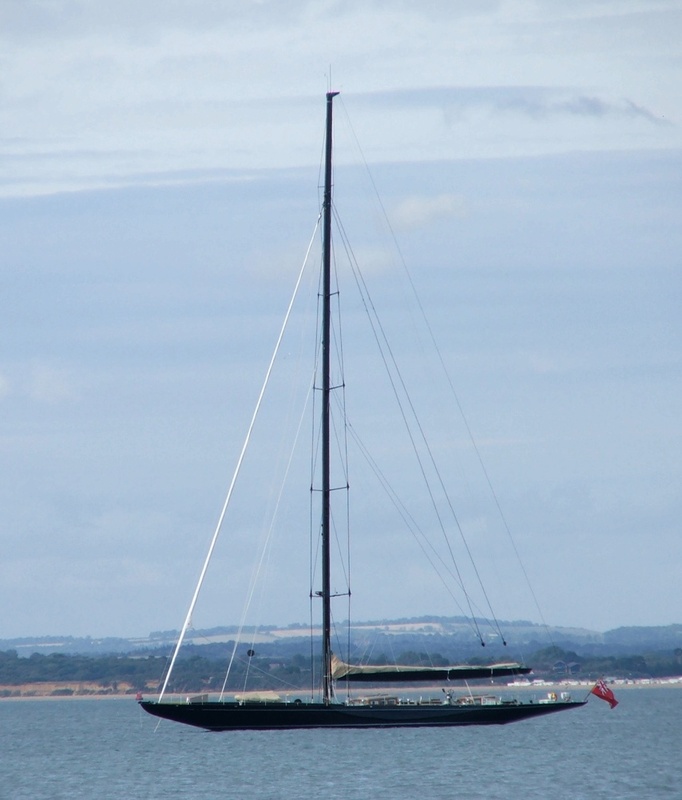 At 30 meters long and a towering 47 meter mast it's hard to miss her even in the crowded Solent. 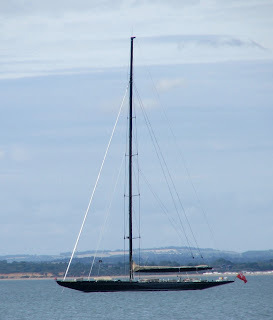 I'm guessing it was quite windy as it looks like the mainsail is reefed, not so the yacht with the orange mainsail which seems to be under full sail. I've written previously on the effects the defence review is having and the the pursuit of new, more efficient vessels, sometimes experimental which the navy are considering. 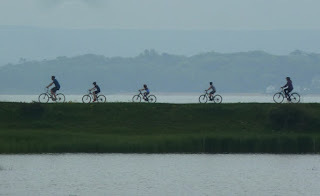 Here's a sneak preview of the latest "stealth" ship undergoing testing locally, in fact it was so quiet I very nearly walked right past, fiendishly clever and combined with a super low emission power plant. 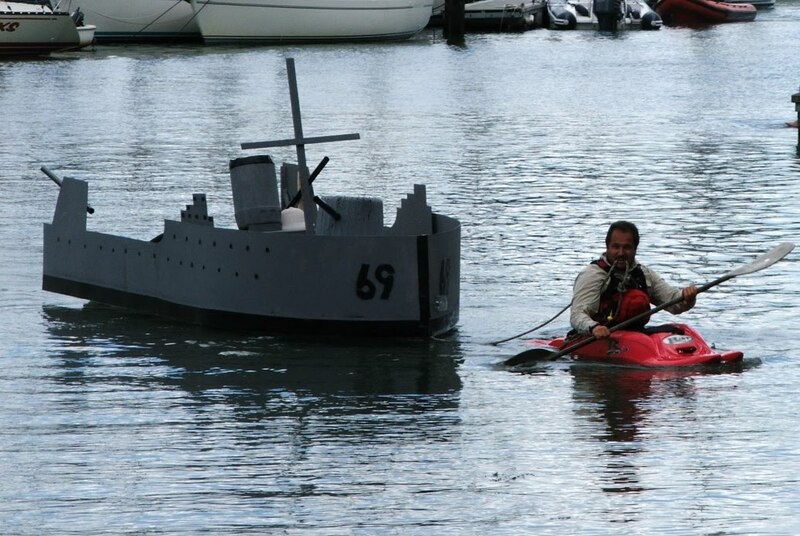 Could this be the shape of the modern navy! 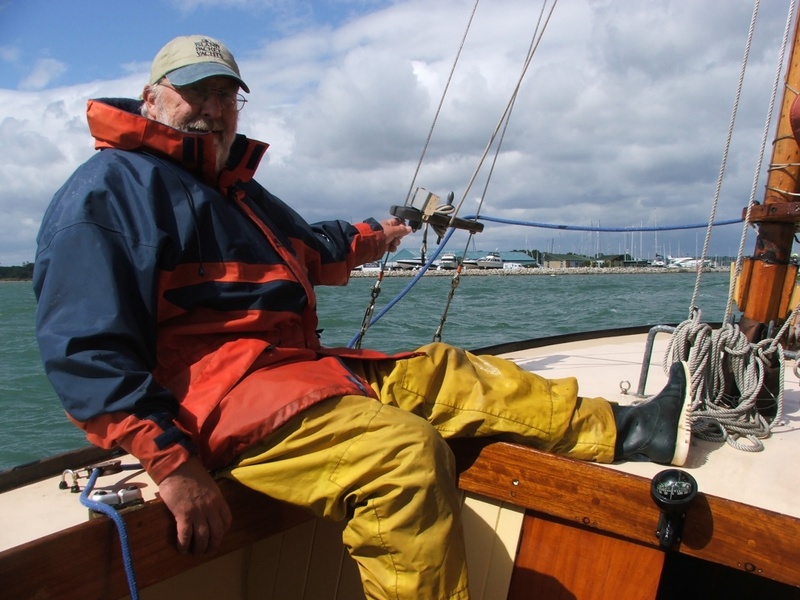 I've written about local boat builder Greg and his very fast Memory sloop Flugel. 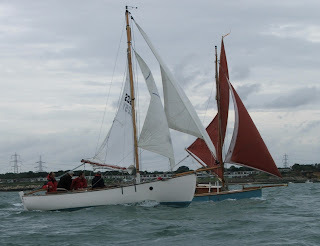 For the past two years he's beaten me at the Bursledon regatta gaffers race, so with Greta sold and no replacement in sight I shipped aboard with Greg as crew for this years race. The day started with a brisk breeze, but the forecast was for stronger winds to come. Above are the local competition; a cabin version of the Memory and a John Leather cutter Blue Gansey. Mid way through the race the wind was a steady force six, gusting force seven, even in the sheltered wares of the Solent it was lively aboard a 19 foot open boat. 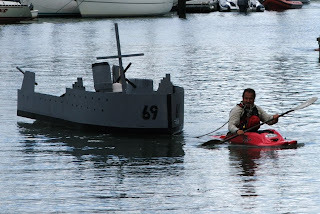 Although we didn't place well, we did finish, lots of our fellow competitors, including some much larger boats retired. And I think we claimed the prize for the first RAFYC boat to finish. Above Greg at the helm. Below crew Bob who has competed and finished at every Bursledon regatta since the early 1970's, looking relaxed as we sail back into the river.